Ram again heard "UNCLE" he looked at priya. It scourged him. Riya n pihu sat in another couch. Staring at ram in fact frowning at him as they feel he spoiled their surprise. They did not knew he is their surprise. Soon cady came out she wished ram and went to priya! Questioning priya that did she invited ram too? Was this the reason she was smiling? Cady insisted priya to utter a word at least. Cady then started praising ram, they make a very awesome pair. Priya moved from there saying "well, cady Ram is really cool. I know him. he is very close to me! so guess he was here today!" .. cady was confused.. she moved to living after priya saying "Whatever!".. Ram looked at priya, sadly he took out the gifts he bought for them. He handed them dolls, soft toys, and chocolates and a play station. Both kids rejected to take the gifts saying "y have u bought all these? our papa will get us these things" they turned to priya " hai na mumma" . priya noded her head in positive. She spoke clearing her throat, "beta papa knows all what u like? Right" kids noded their heads "I said papa wil come today!" kids nodded ,they stopped priya questioning "mumma papa looks handsome but ram uncle looks cute [riya winked at ram]" ram and priya looks at each other smiles at what their kids are doing. "haan I said so! Then" she blushed. Cady saw all this trying to make a answer whisper to raina " priya paagal hai, yeah kaisa brain tease hai for these two kids" then raina asked ram "uncle .. r u Mr. kapoor?" raina remember priya saying riya n peehu's fathers name as ram kapoor once she heard his name ram. She looked at priya for confirmation priya smile made her clear. "cady didi u r a fool! U r trying to link up,those who are a couple already.. he is The Ram kapoor! Aunty's husband" cady is shocked , her jaws dropped, peehu went near ram fired a trail of questions. DO U LIKE CHOCOLATES LIKE US? –Ram nodded his head yes! R U BIG BUSINESS MAN? – ram nodded yes. Riya came near him said , mein riya kapoor , this is peehu kapoor aur app ram kapoor ho na? ram said yes. Both looked at priya se smiled and mouthed PAPA signalling through her eyes. Both jumped on ram, hugged him tight. Shouting "papa"that was the sweetest sound he ever heard..there was excitement shock and surprise in the room tears drained down his eyes. "I miss u both papa is sorry for the delay". He felt priya's hand on his shoulder, Her eyes drained in guilt he saw this took her hand in his. They realized that the situation when raina's camera flashed on them. Evening went on so well. Kids are overwhelmed with ram their papa. Ram is in bliss of his surprise. Kids are not leaving ram, this dinner was the best ram ever had, al his fav are their fav they r copies of him ! He enjoyed feeding them. Kids said ram many things. Its bed time kids insisted ram to be with them as they felt he will be leaving tomorrow. So priya said cady ,raina will sleep with her cady said will sleep with kids, jaldi utna padega aap ke kamremein .. ram smiled assured riya n peehu " my two angels .. papa is never going to leave u, u r my heart beats. [priya's eyes wet again she is guilty] he kissed the kids,raina pehu riya and cady slept. Ram stepped out went to other room where priya is arranging his things. She asked him to sleep in this room she will sleep out in couch! Ram caught her hand " y not here! Last night u were with me so near am drunk not dead! Do u get it, I felt ur lips on my lips I felt ur warmth. Don't worry I will not ask y u did this, I will take this blame on me because am guilty too. Am responsible for all this" she didn't say anything gave him clothes to change and came to room took another side of bed,both face their backs. There is awkwardness in the room. Lot to be unveiled. Lot pain yet to be cured. Ram promised himself he will clear this. 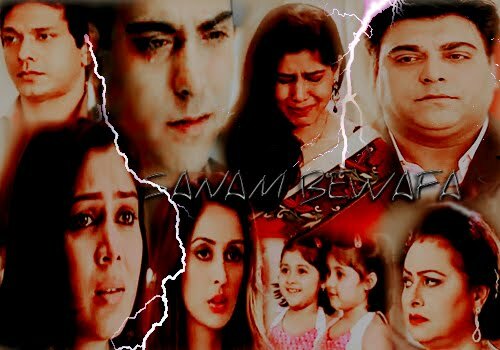 priya promised herself that she will rectify her mistake, she wil not let ram away from her kids and never let any thing touch her family. she made her mind her priorities Cady n raina are her responsibility. Ram turned to her, checked her she was asleep ,he brushed her hairs tuck them behind ear, kissed her cheeks, moved near to her circled his hand around her waist . After she felt him snoring she moved close to him made herself comfortable in his arms, clasped his hand pulled it close to her heart. Both felt each other so near n slept comfortably thinking the past when they spent together. In her sharing apartment, she went to kitchen with wet hairs wearing a robe. She saw the couch with blanket and pillow. She then remembered "Ahh.. ram is here" ,her lips curled to smile she forgot to dress up thinking no one is in home she came out in robe. Ram came out struggling with his tie. She came near to him took the tie and started to knot it.. she smelled fresh with those wet hairs, moist pink lips, he felt weak. She noticed his muscles loosen, she blushed to his response, after al its her ram. his looks are complimenting the women in her. His eyes dropped at the slit of the robe, little down her neck. Priya blushed more,her skin flushed red. He became curious for more better view. She tightened the knot tight to his neck. She crossed her arms stood infront of him. R; itna jaldi kaise.. not yet..
R: ram's face became bright with a wide grin he said ….] haaan..[he stopped looking at her] haan tik hai ..tie… thanks..
P: breakfast is ready .. eat n go. Ram made coffee for them knocked her door informing her that he is leaving . when she came out she saw a note under the coffee mug. "thanks for the breakfast , its delicious, and tie it was perfect here is ur coffee madam have a nice day "
She set off to office, a normal day but she did not meet her new boss yet. Ram is at his office checking all the documents and details of the company. he regret abt his decision it is one hour late, he signed the agreement then vikram told him how bad was the companies state. Nish and tony are worried. They saw priya's smiling ! nisha went nuts seeing her smile in such awful condition of their jobs. Tony stopped her to disturb priya's smile saying it is rare we see her smile … She is smiling from her heart some one has brought the lost smile back. Nisha realised it and was happy seeing her happy. She came back home dull. Ram reached home tired. Both collapsed on the same couch. His bad decision of buying a wrong company he has to put lot of efforts in it. She told him that she is not sure of her job. Days passed on ram priya were busy with their professional lifes. ram arranged meeting to his new employees to announce who is in n who is out. During lunch his PA came to priyaand her friends, they talked to her to know how their boss is?. Young , single, Hot, S**y, handsome, ravishing one after the other she took a deep breath firmly said he is very strict,very punctual. They understood that his PA is totally ovry him, priya excused herself seeing ram's call. they were late talking to each other. Ram dint want phone line to go dead she insisted as she is late for the conference .. she went to conference hall late. Ram's PA came to inform him he is late. The door opened a lady voice broke the dead silence of the hall, excuse me sir.. it was familiar to him the chair turned towards her. He stood up gapped his mouth in wonder,project file fell down from her hands. Swallowing air down his throat ram maintained a fake authority in his voice said "ur late" ..she opened her eyes wide she is late because of him.. "sir, … am sorry" he said "oh.. ! tha's ok come have ur seat" he managed a smile. His old employees who knows ram looked surprised that he did not shout! Before the meeting start he checked the list of people skimmed for priya's name. he failed. He informed his employees those are fired. lucky enough she is not a part. he got an idea! He made changes that moment, all the new staff will remain he informed all the new staff to meet him in his office. He left the hall instructing his PA. She was curious of ram, and ram even is curious of not finding her name on list. ..
She called ram he acted sleep, she started waking up kids. common get up my angels, don't u want to meet to dayijaan? She leaned down to them caressing the,kissed them on their cheeks. Both kids woke up upset. They crawled over ram to her one to her lap and other hugged her neck from back.. they want to stay in house as they have no school. Ram opened his eyes seeing the mother daughters bonding. Priya was helpless can she leave them to ram?. She instructed them to get ready soon. Both denied as they was to spend in home with papa. She tried to explain "beta..papa .. can ram manage u both?" "mummy please" they showered priya in many kisses.. she checked ram still pretended to sleep. "hmm ok but , don't trouble papa. be good girls,.ur papa is sleeping still how do I tell him how can he manage u two!!." She turned to wake him up, then ram opened his eyes staring at priya! She gave him a stern look and asked him can u manage kids or shall I leave at dayijaan's place.. he assured her he can. Priya kneeled down to kids instructing them not to make home a mess! Ram said angels say bye to mumma! They hugged her n kissed her said bye, in an order ram hugged her tight n kissed her on neck inhaling her scent n was lost in nuzzling her neck ..he heard her stern voice, "RAM .. BACCHE.." he broke the hug.. she gathered herself and left the house thinking don't know how will he manage them ..